Experts from across the WHO European Region met on 29 August 2018 to discuss financing primary health care. Existing evidence shows that investing in primary care can reduce overall health costs and the use of secondary care. Primary-care doctors use fewer resources in terms of hospitalizations, prescriptions, tests and procedures compared to other health specialists. As primary health care improves life expectancy and reduces mortality, it provides economic benefits as well as obvious value for health. 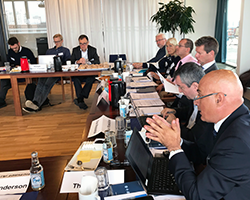 On 29 August 2018, experts from across the WHO European Region met in Copenhagen, Denmark, to discuss the scope for the new taskforce to evaluate and provide further evidence on the economic case for primary health care. “Now more than ever, there is a need to transform primary health care to overcome growing health and social challenges, and to reduce widening inequalities in the Region by upholding the Alma-Ata principles,” said Dr Hans Kluge, Director of the Division of Health Systems and Public Health at WHO/Europe. This year is the 40th anniversary of the groundbreaking Declaration of Alma-Ata, adopted in September 1978. It expressed the need for urgent action to protect the health of all people through primary health care, and promoted equity in health, the use of appropriate technology, intersectoral collaboration and community participation. The Government of Kazakhstan, the United Nations Children’s Fund and WHO are co-organizing the Global Conference on Primary Health Care on 25–26 October 2018 to reaffirm the original principles of the Declaration and renew political commitment to primary health care. Dr Søren Brostrøm, Director General of the Danish Health Authority, hosted the meeting. He explained the special significance of primary health care for Denmark, noting that the Declaration was agreed during the tenure of WHO Director-General Dr Halfdan Mahler, who was Danish. Today, the Danish health system is also undergoing reform that places greater focus on primary health care, in part to address the changing needs of an ageing population. The taskforce will be launched at the 68th session of the WHO Regional Committee for Europe in September 2018. By providing ministers, policy-makers and donors with the economic evidence for investing in primary health care, it will help guide future recommendations, decision-making and policy development.